The ECO Group Inc. Redefining "Lifetime Guarantee." -Manufacturer of Non-Differential Single Action, Zone/Fixed Zone Dry Pipe Valve Assemblies and Apportioners. October 2014, Michigan State approval residential manufactured HUD CPVC Dry Pipe Fire Suppression System Utilizing a 1" ECO Non-Differential Dry Pipe Valve. Safe Antifreeze System for Fire Suppression. Addressing the NFPA Safety Alert 2010, The ECO Group Inc. Submits it's ECO Dry Valve Line for Patent branded under the trade-name "Apportioner." The Apportioner utilizes the same design and configuration as it's predecessor dry pipe valve and utilizes antifreeze as a priming fluid to close the device. The timing being near perfect is intended to allow for existing antifreeze systems to be reto-fitted for the purpose of controlling system antifreeze pressure thus reducing or eliminating current issues associated with these systems. www.nfpa.org/antifreezeThe Apportioner is the solution. Thank you to everyone who attended the 2009 NFPA Conference & Expo in Chicago. Thanks to everyone who stopped by the ECO booth to witness this quantum leap in dry pipe valve technology. Thank you to all who make this event possible. June 8-11 2009, McCormick Place Chicago, IL Space # 875 The ECO Group LLC. will display and perform operational demonstrations of 1" through 2" dry pipe valve assemblies. Demonstrations of manufacturing will be performed on-site!! The unit will be set and tripped and show attendees will be encouraged to set the devices in a "Hands On" interactive. We will be located directly in front of the NFPA booth off the main aisle. For the floor plan please visit www.rocexhibitions.com/floorplans/09nfpa/start.html. In addition to fantastic demonstrations, The ECO Group LLC. staff will be on hand to register manufacturers representatives. Come by and see for yourself why this technology being called "The Greatest Advancement In Fire Suppression Technology in 75 Years." Also, look for us in the NFPA Journal "What's Hot" section of the June 2009 edition page 133. July 2008 Dry Pipe Valve manufactured by The ECO Group Inc. receives "Green Light" from Underwriters Laboratories after a successful IPI report. June 2-4, 2008 Las Vegas, Nevada The ECO Group, Inc. will attend the NFPA World Life Safety Conference and Exposition @ the Mandalay Bay Convention Center. Staff will be on hand to recruit Manufacturer's Representatives and Distributors. If you are interested in becoming a Manufacturer's Representative or Distributor you can contact Robert A. Long @ (248)-860-6544. April, 2008 The ECO Group Inc. receives a U.L. listing for its dry pipe valve. June 3-5, 2007 Boston, Mass. After much research and perseverance, The ECO Group, Inc. will unveil its newest innovation at the NFPA World Life Safety Conference and Exposition. 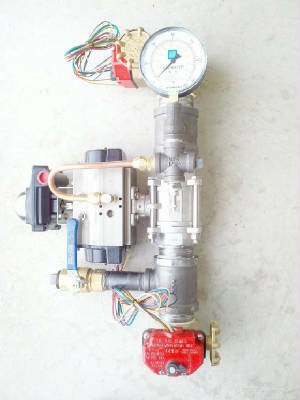 An actuated dry pipe valve that will suit the needs of residential fire suppression systems 13D, as well as 13R, and 13. On this initial test, the actuated dry pipe valve unit and "Plastic" piping was placed within the fire circle of a one hundred square foot camper. All piping and components were exposed. The unit tripped and extinguished the fire in under ten seconds using only water at 50 psi. The result was amazing. The fire was contained to the source of ignition with zero visible signs of damage to any of the surrounding area. The unit itself was unscathed and is the exact unit on display in Boston. 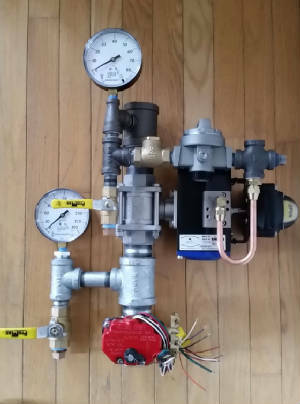 The actuated dry pipe valve, manufactured by The ECO Group, Inc., is intended to finally bridge the gap and provide the ultimate life safety system at a low startup cost, low installation, and low maintenance. Fully integrational to satellite, cellular, and land lines, the unit can be monitored 24/7 by The ECO Group, Inc. as well as local municipalities.